Each field session lasts two weeks. The sessions are designed to introduce methods in field geology and geological research across a range of disciplines. Each session involves doing geology outside in a research environment with faculty who specialize in the area. Each session provides an exciting opportunity for students to learn crucial skills needed by every geologist. Each field session counts for 2 credit hours. While everyone is encouraged to do at least four sessions, students are allowed to register for one, two, three, four or five sessions. Note that some of the sessions in Idaho may run concurrently (at the same time). Register for only one session in a given time slot. It is not possible to enroll in two sessions that run at the same time. A permit is required from the School of Geosciences before you can enroll in the session(s) of your choice. All students interested in enrolling must have a permit and must have fullfilled the prerequisites listed for the session(s) you are requesting admission to! 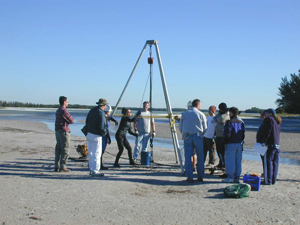 Non-USF students are welcome enroll in any of the field school sessions. Enrollment is open to all undergraduate geology majors who have fulfilled the required prerequisites. Non-USF students are responsible for paying USF tuition and activity fees for each session attended. Please check with your undergraduate advisor to ensure that the field school fulfills your graduation requirements. Please contact Danny Lindsay (email: dlindsay1@usf.edu, phone number: 813-974-7461) in the USF School of Geosciences for more information about enrolling in our Summer Field School program. All sessions will be charged an activity fee. This fee will not exceed $650 per session. This fee is in addition to the regular tuition. Some additional expenses will be incurred. Airfare and other travel expenses to a designated field headquarters is not included in the fee and must be provided by each student. Usually this means travel to a meeting site such as a particular airport or hotel. Non-USF students must pay an application fee as a non-degree seeking student. Details will be provided well in advance for every session. The activity fee will be the same for each session. Note: The College of Arts and Sciences subsidizes the activity fee for degree-seeking USF students. It is important to realize that each session will be very time-consuming, and it will not be possible to be registered, concurrently, in other summer courses. Enrollment is limited. Do not delay!